Tourist Board Registered VT-447460-A to comply with the law of the Communidad Valenciana. Sleeps 4 ONLY Newly professionally covered naya furniture for 2015! See photo 24New Hot tub cover, co-ordinated to garden furniture for 2016! New sofas for lounge 2016! Situated by El Rafol D'Almunia, Costa Blanca, this 2-bedroom apartment sleeps 4 .The villa has a private pool hot tub, gardens & terraces shared with us. Apartment has it's own pool terrace with panoramic views of mountains and the sea, the apartment is 40min from the main resort of Benidorm, & 30min from the city of Gandia. Adding the fact that the closest beach is only 10-15 min away at Deveses, the apartment makes for an excellent starting point for all your holiday needs. It is also within 20min of some wonderful blue flag beaches and at least 3 international golf courses. The house is built into the mountain itself and so keeps beautifully cool in summer, and nicely warm in winter. Children must be supervised at all times by a responsible adult when in the area outside of the apartment (the mountainside, the steps, pool, etc). Welcome pack for all visitors. We have 3 well behaved, friendly & vaccinated etc, free range cats, not allowed in apartment. Hot tub for use of persons over 12 years of age. Adult space. Golf, cycling, watersports: We are situated near to at least 3 International Golf Courses. Water sports are available from Javea, Denia and most of the local beaches - anything from hiring a pedalo to snorkeling and scuba diving. Bike hire available in most beach resorts. There are many cycle clubs locally, too. seasonal show jumping at Oliva with MET. Horse riding in Oliva. We now offer internet access. Hard-wired for security with cable connectivity in the hallway. Spanish isp broadband connection. Hiking, wlaking and climbing: This area is popular with walkers, hikers and rock climbers. For the adventurous with the appropriate training and mountaineering gear, try scaling or climbing the Penon D'Ifach in Calpe - the 'rock' that goes out to the sea! The less adventurous can stroll part of the way up using the footpath! Orba has a 'tree tops' assault course! About 10 minutes drive away, this is an organized tourist attraction. Details in the information folder in the apartment. Steve, Gail and Robert started their spanish adventure in 2007. Robert has now left home, being 22 years of age. 'Casa Rosina' has been a labour of love for us all since then. This is not our first holiday rental experience, we rented 2 cottages in Norfolk for 6 years before long term renting these and making a move to bring our own brand of relaxed holiday rentals to Spain. We are a quiet family, happy to be on hand to help and advise if needed, but maintain a low profile and respect the priviacy of our guests at all times. Our spanish adventure has made us many new friends across the globe and each year when we open our doors once more, we are still excited about what the year will bring. Steve's work as a design engineer means he spends periods away from 'Casa Rosina' at which times, Gail and Robert hold the fort. Robert is a student at the University of York during term time and Gail is a former lawyer who switched the court room for the play room when she had Robert and became a supervisor at a charity playgroup in Norfolk. Her full time job now is caring for 'Casa Rosina' and its' guests. At present, the family includes 2 well behaved cats, Benito and Bali . We are proud to be registered with the Generalitat Valenciana office of Tourism, Alicante. If you are seeking a truly relaxed holiday, in a friendly environment, with stunning views across the mountains and the sea, look no further. Read our reviews, they speak for themselves! Now Tourist Board registered in the Communidad Valencia, a legal requirement for all rental properties, whether hotel, self catering or b&b, we are proud to be a part of the Spanish Tourist Board quality control, which assures you, our guests, that we offer the best service possible. Our aim is to provide real value for money but quality too. This is something we never seem to find when we go away and something which we aim to do here at 'Casa Rosina'. Our guests tell us that we certainly achieve this and it is our aim to continue always to do so and to remember that for each new guest, this is a new experience for them and we never forget that and extend the same warm welcome to all, be it at the start, middle or end of our season. The apartment is very well equipped and is cleaned between guests to a very high standard. We could go on but just suggest you read a sample selection of the reviews. We don't have a website, but we do have a friend;y and lively facebook group which you are welcome to apply to join without obligation. Search for "Casa Rosina Spanish Villa Apartment" on facebook and ask to join. The hot tub and a virtually private pool in a villa at a mere fraction of the cost of a complex appartment rental, the facilities of which are used by many. Hot tub for adults only, over 12 years of age. Free WiFi - just log on and away you go! No restriction on useage and you can couple up tablets lap tops and smart phones to it. Even access skype to stay in touch with your family for free during your stay. Please respect the law and do not download illegally from the web. Thank you. We assure you of a warm welcome and will do all we can do make sure your holiday is memorable for all the best reasons! Modern bathroom with separate shower cubicle as well as an over-the-bath shower head. Bathroom towels and floor mats supplied. sea views. Nearest beach Las Marines, sandy beach, goes on for miles. 15 minute drive to the beach. Rafol is the nearest village. 2km away. local shops, communal 50m pool, chemist, hairdressers ( they speak English) 2 bars, restaurant, Ermite, Church and historic monuments. calor gas heaters to keep of any chills in the cooler months. bathroom, hand, kitchen and pool towels provided. Please bring your own beach towels and please do not take out towels provided to the beach. Thank you. pine ercol table and 4 Ercol dining chairs. Placemats, table cloth. free to view UK channels. Mountain garden with plants laid to gravel and amphitheater steps to lawned area. Seating for 4 at table and chairs in lower garden area in additional to table seating alongside pool terrace. The naya overlooks the garden. by the pool, with sun beds, also eating area with table and seating for 4. Solar shower available. Raised flower beds. This is a "young child" free zone for adults and older children to relax in. over 12 years of age to use this facility. Shower before use obligatory. 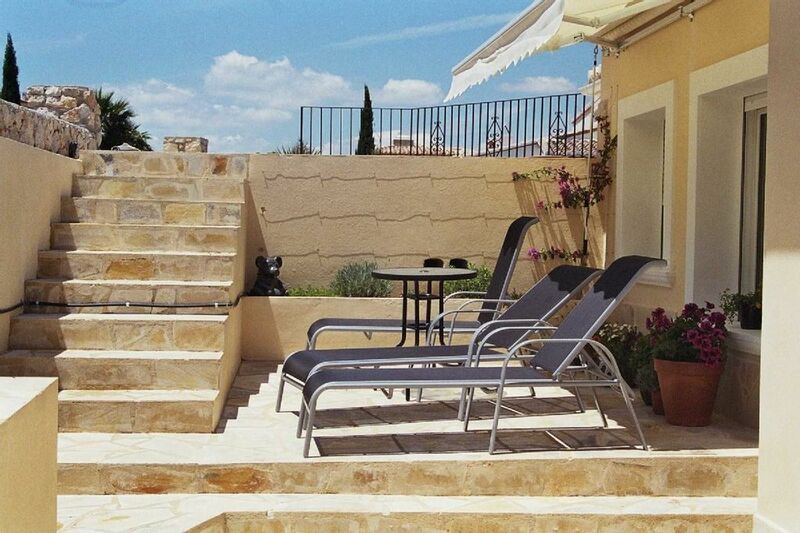 This is a mountain property and is accessible via a steps from the pool terrace, as such is not suitable for people who cannot navigate stairs. No smoking in the apartment, but it is on the road. Ash and butts must be put in water! The apartment also benefits from a glazed Naya, or conservatory, with comfortable furniture to seat 4, also a coffee table and views across the Med! All floors are tiled, but for your comfort, rugs beside the beds are provided in the winter months. Calor gas heaters available for chilly winter nights. Owing to location, this apartment keeps beautifully warm in winter and cool in summer. Unusually for Spain, there is mains drainage and water supply. Gas for the water is piped to the house and is not bottled, so it is possible to enjoy all the comforts of home away from home. There is ample seating at the large 4 seater table on the pool terrace to enjoy outside eating. Sunbeds & coffee table. Thank you all for the lovely review. We are so happy that you love Casa Rosina and our animal family as much as we do. We loved the photos you posted on our Facebook page of Torty! Our mountain location is perfect for stunning views but, yes, a car is essential for getting about. We hope to welcome you all back to stay again. Wonderful relaxing week in a lovely apartment. Had a week at Gail and Steve’s apartment and it was not long enough! The setting is fabulous and we never tired of looking out across the villas towards the sea. The apartment was spotless and had everything we needed. The pool was so inviting in the sun and the hot tub in the evening was lovely and refreshing. Gail was always good to have a chat and laugh with and plenty of advice. Only met Steve briefly but was so friendly. The area is very peaceful to relax and enjoy a drink or two! We didn’t go too far due to an injury but we were more than happy with this. We cannot fault this place at all. Everything was wonderful and we will visit again. Casa Rosina was very clean And confortable. Gail and Steve are so nice And welcoming. Thank you for your review, written in English. I apologize that our French is not as good as your English! it was a pleasure to welcome you to Casa Rosina and thank you for sharing your photos with our facebook group.I am sorry your daughter needed the doctor whilst she was here, I hope it did not upset your holiday too much, but so glad you had excellent treatment at our health centre. Thank you for the care you took of Casa Rosina and for leaving the apartment clean, it is very much appreciated. We have left you a 5* review so that other owners will know you take care of the property during your stay. We hope to welcome you again. Second time to vist..... now more in love! This was our second time back to Casa Rosina . We returned as we found the first stay very tranquil and idyllic. We were nervous returning to the same place again as generally we like to try new places but we were not disappointed. The moment I drove close to the Villa, that familiar feeling came rushing back and I felt I was 'home'. We settled back in so quickly this time as we knew the area, villa and tourist attractions. You can read our 1st review on this web page also under the heading 'Tranquil Heavenly Perfection Amazing views' this gives basic details about the villa and location. Nothing had changed and that's a real good thing. Gail and Steve are the most superhosts and have very high standards and excellent customer service skills. The Villa is spotless, hot tub and pool and lovely garden. I can only advise you try it. You will not be disappointed with his villa. It is as you see in the pictures only much better in real life. I still get the wow factor with the views and I'm honestly just a wee tad jealous of Gail and Steve for the beautiful place they can call home!! Thank goodness they had it in their hearts to share it with others because really it is too good to keep all to themselves. We will return and hopefully many times again. We have found a true gem and you will too. Awww. Thank you so much for the super review. It is always fabulous to welcome returning guests, and we have had a few! We are blessed to call Casa Rosina home and it is our pleasure to share our home and that view with others. Please come back again for more rest and relaxation. We would love to welcome you once more. Gail and Steve, Bali and Benito cats and Torty Boy the tortoise! I guess if you are reading this review, you are already considering a stay in this amazing villa. The meandering roads and views on the way to the Villa are simply breathtaking. This area is lush and green, with mountains all around. On arriving at the Villa, We felt at home straight away. Gail was there to meet us and we knew everything would go smoothly as her communication from enquiry to departure is excellent. Gail is always there to help but never intrusive. A wealth of knowledge for day trips, Markets, beaches, fiestas, Zoo, cities and anything else you might want to visit. The Villa is so secure ensuring you will feel very safe throughout your stay. Own alarm and rejas plus locked doors. The living area like the rest of the villa was literally spotless, light and airy and Views to die for. You will never tire of waking up here. The Peace and quiet of the area will also ensure a peaceful nights sleep in very comfortable beds. The rooms have lots of Wardrobe space and drawers. The kitchen was equipped with every utensil you can think off for any occasion you can dream up! The dish washer was a real bonus, as was the washing machine and clothes line. The TV with UK channels was great although there is so much to do in the area, you won't need a TV. The Hot tub was gorgeous and warm and again those views....WOW!! You really will not want to leave. We were very sad leaving and we are returning again next year! The pool is spotless and Gail is meticulous about the cleanliness of the pool for all the users. The property was very well maintained, clean and very attractive grounds. Lots of different areas to sit out also and enjoy the coffee , Vino or whatever you fancy! I have to say the description of the villa is as you see in the pictures, it is stunning, very homely, spacious, clean and inviting. Customer service 110% from Gail and Steve throughout. I would definatley recommend you think strongly about this property, only an hour from both Alicante and Valencia airports. Parking is available at the property. Although in a beautiful rural location, the villa is in an urbanisation, with little villages dotted around everywhere. Pego was great value for eating out and grocery shopping and just a short spin away in the car. The beaches are amazing and were never crowded. The sea was warm and inviting and the beaches were kept very clean. Wow, what a wonderful review! Thank you all so much. It was our pleasure to host you and we are so happy that you loved it at Casa Rosina and will be returning in 2018. We never tire of the views from the terrace, or from driving around this beautiful part of Spain. I have to say, I don't think the tourist beaches are a patch on our local, quiet, sandy beach where the dunes lead to swept beaches and where you can swim in the crystal clear sea. Pego has the best value and the best food I think in the Costa Blanca. We go to eat elsewhere, but return again and again to Bar Daniel's, L'om, el nou portet ( Orba) and to the many restaurants that serve typical spanish food , well cooked, quality meals at a fraction of resort prices. We are delighted to have received such a lovely review. We strive hard to make Casa Rosina a friendly and inviting place to stay, and we really do enjoy welcoming our guests and making sure they have everything they need by way of information before they arrive and during their stay. The property we maintain ourselves and take pride in so doing. Cleanliness is very important to us, as no one wants to think they are staying anywhere with someone else's dirt present! Our check out times may seem early, 10am, but we need that time until 3pm to make sure everything is as clean and welcoming as it can possibly be for all our guests. Again, thank you! We look forward to your next visit . I stayed with Gail and Steve for a little under a week, upon the invitation of their Son Robert, who I knew from university. Gail and Steve maintained a clean, friendly, well connected apartment, with an amazing view of the sea. Just below Monte Pego, it was perfectly sited between the mountain and the sea. Steve and Gail were perfect hosts; helpful, friendly, and knowledgeable, nothing was too much trouble for them. I would recommend this apartment to anyone who likes sun, sea, and a relaxed environment. Awwww Tom thank you. It was our pleasure to meet you and to help you get to make the most of your stay here with your friends. Benidrorm for nightlife & bars a plenty a comfortable 40 minutes away. Historic Gandia, truly a Spanish resort, around 30 minutes drive away. Safari Park El Vergel is 10 minutes away - lions, elephants, tigers, seal & bird displays daily. Pre-historic Caves at Val D'Ebo & Benidoleig a short breath-taking mountain drive away. Security Deposit of £200 /200 euros euros This is to cover loss & damage to the property & it's contents. This is returnable at the end of the stay after inspection & hand over of the keys, if all is found to be satisfactory. oven/cooker and BBQ cleaning charged at £25 each if not left as found. Hot tub use for adults only. Must weigh under 15 stone to use the hot tub. We charge £30 "toddler" surcharge for children staying under 6 years of age, for the expected excess cleaning owing to sticky fingers of walls, windows, doors etc. We do not charge for the odd broken glass/plate as we expect some breakages of this nature.